After creating the Chrome REPL extension, I was curious if it would run under Chrome OS and ChromeBook. To try it out, I was able to get my hands on a Dell ChromeBook 11, and It was nice to see that it worked perfectly. 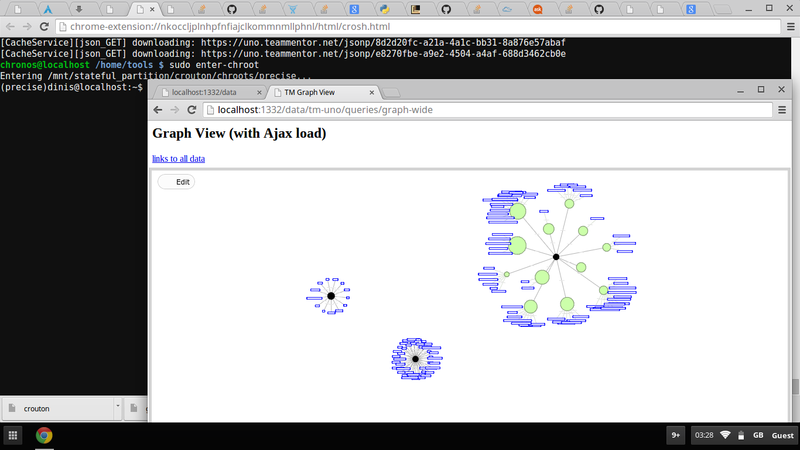 While using the ChromeBook I was thinking that if I was able to run (tools like) git, node and LevelGraph (which is needed for my current dev focus at SI: TM_Graph_DB) I would have a really portable development environment (specially for running longish batches of Unit Tests). Crouton is actually a really nice solution, since it creates an 'Universal chroot environment' for ChromeOS. My first efforts were based on manually getting/downloading the missing packages (like git, node and python from archlinux). Using the technique of 'mounting an folder from an SD Drive without the noexec setting' (into the /home/utills folder), I was able to get git, node and python to work ok (For example, I was able to clone and run the tests for the fluentnode project I recently published), but it got messy getting node-gyp to work, specially since it needed python (2.7) and make and g++. The Crouton solution is much better, specially since it doesn't require touching the original Chrome OS bin folder (note: another prob to solve, was that by default /usr/bin folder only had 200Mb of free space, which is not enough to install node and git).